One of the easiest and fastest ways for me to lose weight is to stop sugar cravings, and I am going to share 10 easy ways to stop sugar cravings for good. That means to cut out sugar all together in my daily diet. I know. It’s SO hard. The will and discipline to succeed is difficult. I get it. I know. Failing is on my mind, but it shouldn’t be the reason to not stop sugar cravings. What I have found is having alternatives to refined and processed sugar makes it possible to be successful. I have also found that having a game plan and options is the easiest way to stop sugar cravings. Everyone knows how bad sugar is for you and it certainly had some pretty bad effects on me. I had to have so many dental treatments from dentists such as Dentist Fort Wayne to try and fix my rotten teeth, thanks to sugar! I am going to sharing some of my ways that I have found to be helpful cutting out sugar in my diet, but I also turned to my guru fitness nutritionist sister Christine for additional ideas. She works with clients developing eating plans, and she knows many ways on how to stop sugar cravings and keep it off for good. Here are 10 Easy Ways to Stop Sugar Cravings for good! Drink Water…and lots of it with lemon. Start your morning off right with a big 32-ounce glass of water and squeeze a lemon in it. Lemon coats the inside of your stomach wall, which aids in digestion. It’s a great way to flush out your system, keep you hydrated and jump-start your metabolism. Also it suppresses the appetite so it helps with weight lost. In return, drinking water with lemon will crave those sugar needs! The best way to satisfy your cravings is to drink water. Dehydration confuses us with the need to eat and have sugar. Drink a big glass of water in between meals or when you feel the cravings. If you want you can add lemon, cucumber, basil. Or any other fruit to your water to add flavor and sweeten it up. Avoid Processed Foods. There is so many hidden sugars in processed foods. Make your own instead. You’ll be surprised how much sugar is in salad dressing, ketchup, salsa or even pasta sauce. If you can’t make your own, then find one that is sugar free or low sugar. Read labels when shopping, and be aware what you are putting into your body. Find alternatives to Sugar. There are plenty of other sweet tastes out there besides sugar, therefore you should not struggle to find sugar alternatives to help you lead a lifestyle filled with little to no sugar at all. We all know too much sugar is bad for us, so this is a great way to make a change. Use healthier alternatives like maple syrup, raw honey, Aspartame, raw blue agave or stevia. These alternatives don’t have the same evil effect that white sugar has on the body. But they will make you feel like you are getting your sugar fix. Be adventurous and try spices like cinnamon and ginger. I love sprinkling cinnamon on my oatmeal, smoothies or fruit. Here are more information about cinnamon that I previously posted about. Cinnamon is a great alternative because it curve sugar carvings and tricks the body into thinking you’ve had sugar. The real trick is cinnamon controls blood sugar. Sweeten with Fruit. Fruit is truly Mother Nature’s candy. I love to freeze berries for a little frozen treat. Watch how much fruit you eat though. Fruit has a lot of carbs. Christine says that the best time to eat fruit is after workout, and to keep it a limit of about 1 cup of fruit a day. Here are a few tasty healthy berry dessert recipes. Protein ice cream–take a 1/2 cup of almond or cashew milk with a scoop of Quest protein powder (any flavor. but I love cookies & cream). Put it in a blender with lots of ice to make it thick and blend. Add frozen berries or a nut butter if you’d like. This is my favorite and I make it when my kids are all having ice cream. Unsweetened plain greek yogurt with fruit and topped with maple syrup and sprinkled with no-sugar granola. Herbal tea with stevia or honey. Make it an iced tea when you are feeling a slump during the day. I love hibiscus tea because it’s naturally sweet and make a great ice tea with honey and fresh basil leaf. Here are some other healthy drink recipes. Drink a tall glass of almond milk or cashew milk or eat a spoonful of almond butter. It’s simple and quick but can definitely curb sugar cravings when desserts are right in your face. Frozen berries or frozen grapes. These are tasty during the summer months and makes you think you are eating a frozen dessert. Save special desserts to once in a while. Don’t deprive yourself. Still enjoy that birthday cake or holiday pie, but make it only an occasional event. That way you are mentally telling yourself that you can enjoy it but you aren’t doing it all the time. Then when you have the sugar, you will notice how your body feels and your chances of not wanting to eat sugar again are good because you are not feeling so well. Sleep! This is my weakness. Finding enough “time” to actually get in 7-9 hours of sleep. We are all so busy, but sleeping more will balance the hormones so our body doesn’t crave sugar. Distract yourself. When those sugary temptations come or the need to pig out on a donut, distract your self. Have the will power to walk away and make yourself busy or finding the pleasure in something else like watching a favorite television show, calling an old friend, reading a novel or doing a craft. Whatever it is, put your sugary energy into something else. Eat 6 small meals instead of 3 large meals. Eat smaller portions but more frequent. Not only does it rev up your metabolism but it makes it so you don’t get too hungry. It keeps your cravings at bay and easier to grab something healthy. Don’t ever skip meals. 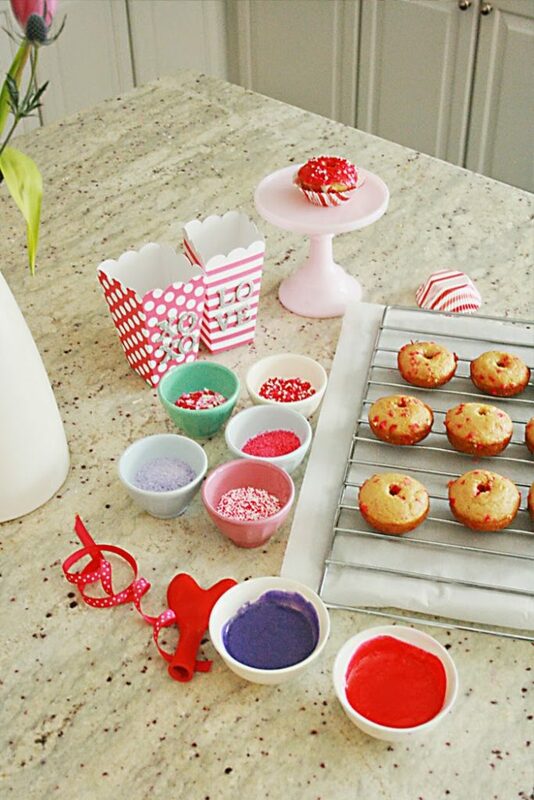 That is a sure way to fire up the sugar cravings. Eat more greens. Yup! Make sure you are adding those dark leafy greens to each meal of the day. You’ll be feeding yourself those good nutritional vitamins and minerals. Opt for crunchy veggies to keep your mouth going and satisfied. Protein Acai Bowl–A great way to start your day off is with a beautiful, colorful berry-coconut Protein Acai bowl. I actually like to eat this Protein Acai Bowl after a good workout. The healthy carbs from the fruit and protein help to replenish and repair sore muscles. The acai berry is packed with antioxidants and healthy omega fatty acids to help lose weight. Research also shows that acai promotes skin health and helps with digestion. There are so many other health benefits, so incorporating acai into your diet is quite recommended. This acai bowl with protein is packed with other healthy fruits and coconut, which also has a ton of health benefits that I have mentioned in previous posts. To make the protein acai bowl, I would recommend getting the puree in the frozen section of your local health store. Or you can get the freeze-dried acai powder at your local health store, which is expensive but because of how it is processed the nutrients haven’t been altered as much. Add chocolate protein (or any other kind of flavored protein) for a yummy tropical chocolate berry thick ice cream-like breakfast bowl. Your sweet tooth cravings will be satisfied while you are giving lots of healthy benefits to your body. Directions: Blend until it is thick consistency. The chia seeds will add thickness to the smoothies. Add more ice if needed. Spoon into bowl and top with your toppings. Sprinkle dried lavender flowers and add a mint leaf for garnish. Tomorrow is Christmas Eve, which means New Year’s Eve is a week a way! We throw a pretty fun New Year’s Eve party, so my mind is already thinking about prepping for that night! My favorite thing about that holiday is all the New Year’s Eve Glam–sequins, glitter and all things fancy! That’s the night you can deck out in all your sparkling clothes and makeup. Not judgment whatsoever! Red lipstick, black cocktail dress, feather jewelry and glittery barrettes. We have our New Year’s Eve party at our house with our children and their friends so it’s pretty casual. But casual does not mean you can’t dress it up! I am planning to wear my favorite leather leggings for my New Year’s Eve Glam. I probably wear them too much, but with a chunky sweater and some glittery jewels and red lipstick, it’s a great way to dress casual up. Styling your hair a glam way is an easy way to make casual fancy. An easy up-do or a large braid or a top knot can be jazzed up with these glittery hair pins by Mane Message. For makeup go bold for a New Year’s Eve Glam look. ‘Tis the season for cranberry lip shades, and Winky Lux Lip Pill in Bunny is the ideal hue for New Year’s Eve. The Dawn to Dusk eyeshadow palette from Stowaway is perfect way to keep eyes simple while the lips are bold. While you are getting ready, keep a matching porcelain dish set on your vanity to catchall your jewelry and accessories. I love keep my feather necklace and feather earring jewelry, which is found in my shop, in my catchall dish. So easy to keep things at hand. So whatever plans you have, give a big goodbye to 2016 and a huge Hello to 2017 by making your New Year’s Eve Glam all out! This healthy bran muffins recipe is a family favorite. It’s the kind of recipe that Grandma makes when her grandchildren come into town. And the recipe my children will pinpoint with happy memories of hot buttery muffins at Grandma’s house. Actually we call these Grandma’s muffins! I really love this recipe because you can throw in a lot of healthy junk in it and kids don’t really notice. Also, it’s not too sweet. You can play around with the recipe to make it really healthy or really naughty (like adding chocolate chips). I gave some different add ins ideas below, and the recipe still tastes so good. These healthy bran muffins are a good start for your morning or an afternoon snack. My kids always requests one in their lunchbox when we have leftovers. One of things I love about this healthy bran muffins recipe is that it uses applesauce to make it moist. I tend to make this recipe a lot in the fall months because that is when I process apples and make my year’s worth of homemade applesauce. But any kind of applesauce will do! Also, what is great is that you can double the recipe and then freeze leftovers. Combined dry ingredients and mix together in a large bowl. Mix wet ingredients in the blender and then stir them by hand into the dry ingredients. Fill muffin tins about 3/4 full. 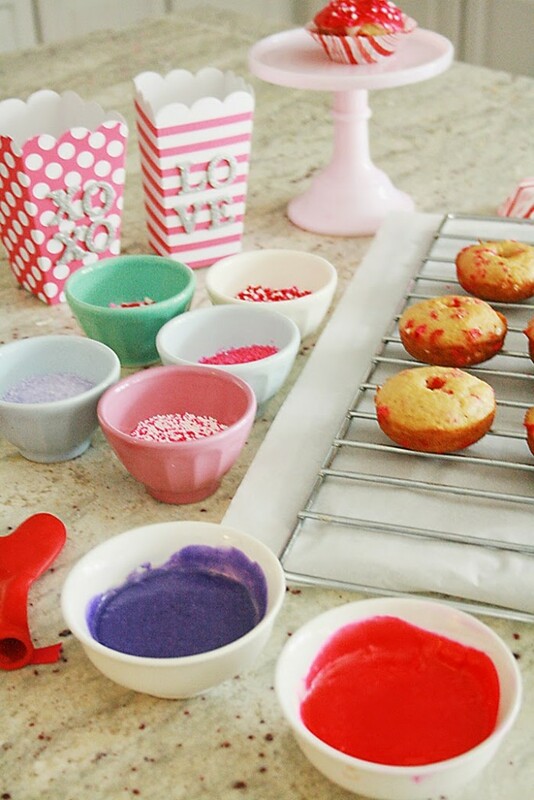 Yields: 12-18 muffins (Recipe can be doubled and muffins can be freeze). Add ins: Add raisins, walnuts, pecans or chocolate chips. Make it a Pumpkin Muffin: add 1 tsp. of pumpkin pie spice. Use 1 1/4 cup of canned pumpkin instead of the banana. 1 cup of evaporated milk instead of milk. 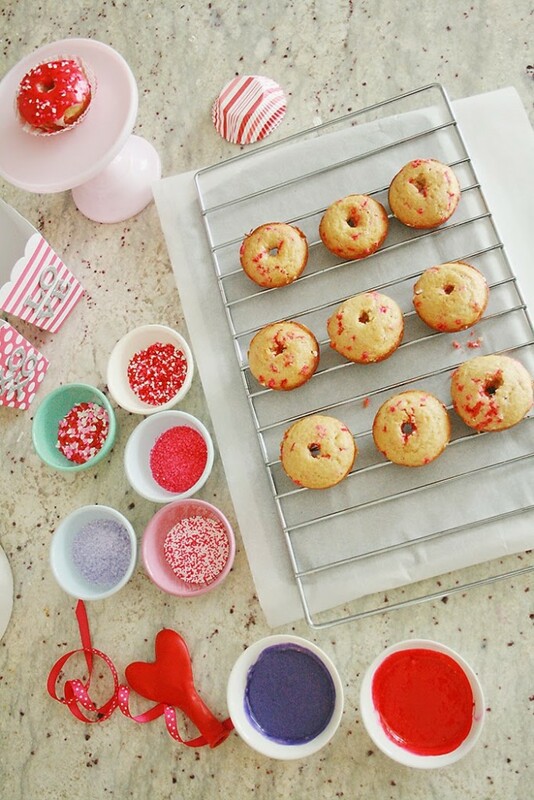 Make it a Cranberry Muffin: instead of milk blend 1 peeled orange in a food processor or blender. Add 1 cup of dried cranberries. So many yummy way at make this healthy bran muffins recipe! It’s the perfect all-in-one recipe! On warm days, we love lemonade, especially when it is tasty and healthy lemonade! Making homemade lemonade is so easy, and tastes so much better than any powder fake lemonade. I usually keep a large bowl of lemons on hand. I try to drink at least two large glasses of lemon water everyday, so lemons can always be found in our home. Did you know that lemons are so good for the body? We just had a stomach virus go through our house, and lemon water was the only thing that we could keep down. I post over at How Does She last spring, sharing three healthy lemonade recipes: Grapefruit lemonade, Cucumber Rosemary Lemonade and Hibiscus Pink Lemonade. All three recipes are tasty and healthy lemonade made with a raw honey simple syrup to sweeten and fruits. For this tasty and healthy lemonade posts, I am sharing other three lemonade recipes: Blueberry lemonade, Watermelon lemonade and Lavender Lemonade. Double these recipes if needed. These will make about 32 ounces of lemonade. Instructions: using a juicer or citrus press, juice the lemon and then pour in glass pitcher or mason jar. Fill the jar with filtered water, leaving room for your blueberry syrup. To make the blueberry simple syrup, combine honey and 1 cup water in a medium saucepan over medium heat, stirring until well combined. Stir in blueberries and bring to a boil; reduce heat and simmer until blueberries are mushy. Use a masher utensil mash down the blueberries, about 3-4 minutes. Turn off heat then strain blueberry mixture through a fine sieve to remove any blueberry chunks. Pour the syrup in a large jar or pitcher with the freshly squeezed lemon. Garnish with mint leaves and fresh blueberries. Instructions: To make a Honey Simple Syrup: place both the honey and water in a medium saucepan. Heat over medium, stirring until the honey dissolves. Remove from heat and add to your favorite beverage. Store the remains in an air-tight container. Place the watermelon in a blender to juice. Pour in a jar or pitcher, along with 1 cup of the honey simple syrup. Using a juicer or citrus press, juice the lemon and then pour in glass pitcher or mason jar. Fill the remaining jar with filtered water. Garnish with tiny slices of watermelon. Using a juicer or citrus press, juice the lemon and lime and then pour in glass pitcher or mason jar. Add lavender buds to the pitcher. Pour about 1 cup of the honey simple syrup to the lemon juice. Fill the remaining jar with filtered water. Garnish with fresh lavender sprigs. I’ve inherited Grandpa Waite’s sweet tooth. I love anything sweet! But I also inherited Grandpa Waite’s love handles. SO, i have to be careful on how many desserts and sweets I can eat or my pants will not like me. If you’ve been following along, you know I love healthy eating, and I especially love healthy dessert recipes so I can enjoy and not feel the sugar guilt the next day. Or the sugar headache! This healthy lemon curd cheesecake in a jar is so good that it hits the spot. A quick recipe, it’s a no-bake cheesecake recipe, and a perfect dessert to take on a picnic outing or backyard barbecue. With Mother’s Day around the corner, I thought this would be a fun dessert to share with your mom (I know mine would love it!). I made the Paleo lemon curd recipe from this lemon curd recipe using Meyer lemons because they are naturally sweeter than normal lemons. This lemon curd recipe is so yummy and can be eaten alone. If you don’t have a lot of time, you can seriously just stop here and top the lemon curd with fresh berries and homemade whip cream. Yum! Place all the ingredients in a medium bowl, except the sweetener. Using a handheld beater or stand mixer, blend until it is smooth and creamy. Scrape down the sides while mixing. Gradually add the SweetLeaf sugar tasting by tablespoons until you are satisfied with the sweetness. I used a little less than 1/4 cup. Stevia is very sweet and coconut cream is also sweet, so if you gradually add the sugar you will know how sweet you would want it. The lemon juice also brings out the sweetness. If you are using Greek yogurt than you might want to add a little more than 1/4 cup. Chill in the fridge until ready to put in jar. Put all the items in a food processor or blender and pulse until well combined. Once you make all three items, take clean mason jars and starting with the crust, then the cheesecake, lemon curd then top with fresh berries. Leave room so you can put the jar top on it. Tie a cute wooden spoon around the jar and put it in a picnic basket. Enjoy your healthy lemon curd cheesecake in a jar! 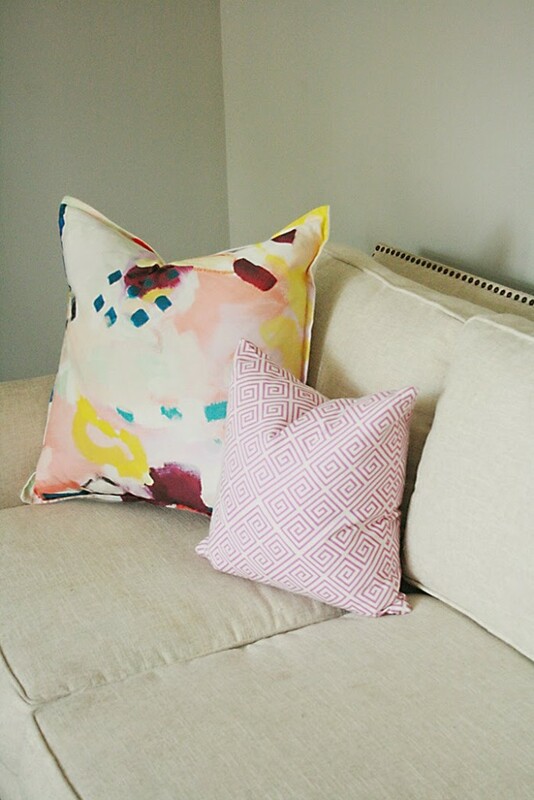 You might have seen glimpses of my white sofa on my IG or previous posts. 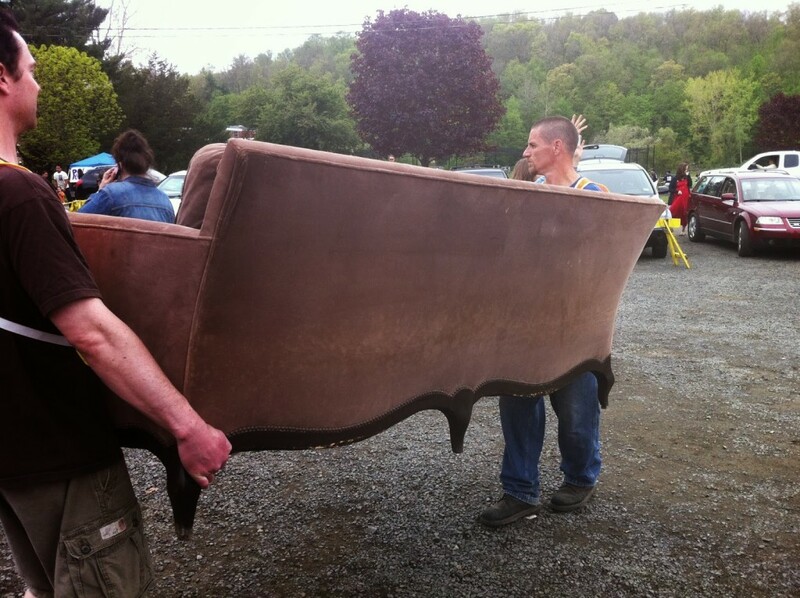 I bought this sofa at the Minks to Sinks flea market in Connecticut. It then sat in my garage for over a year in a half while we moved from Connecticut to Georgia and then rented small house while we settled down in Georgia. I swear my husband was going to take a blow torch to it. It’s fairly huge and took up a large space in our tiny garage. 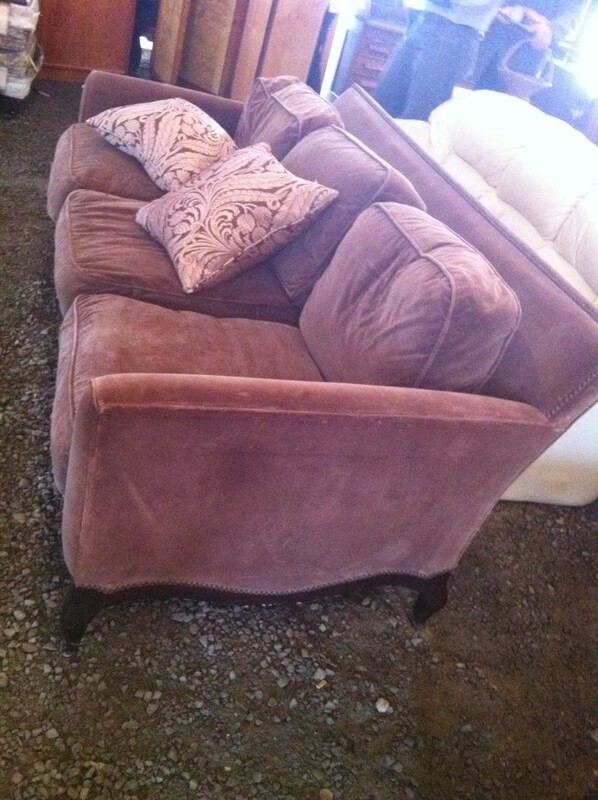 But I saw its potential and really liked the “modern meets vintage” shape of the sofa and wanted to hold on to it. Also I bought it for a screaming deal. 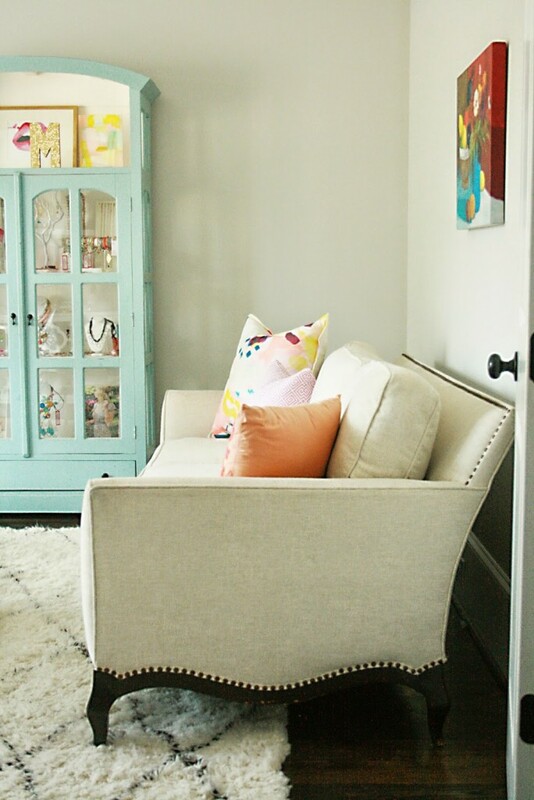 I love a story behind an old furniture piece. 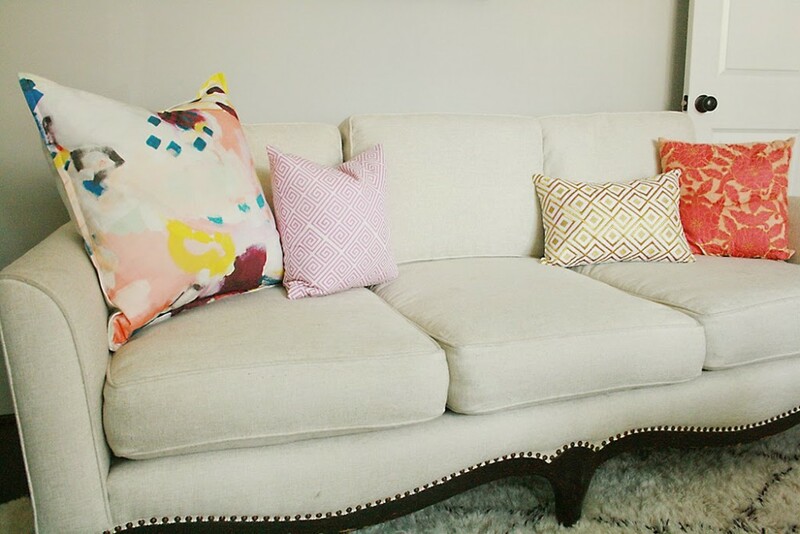 I found out that it came from the home of an interior designer who had three kids…so the sofa got a lot of love. 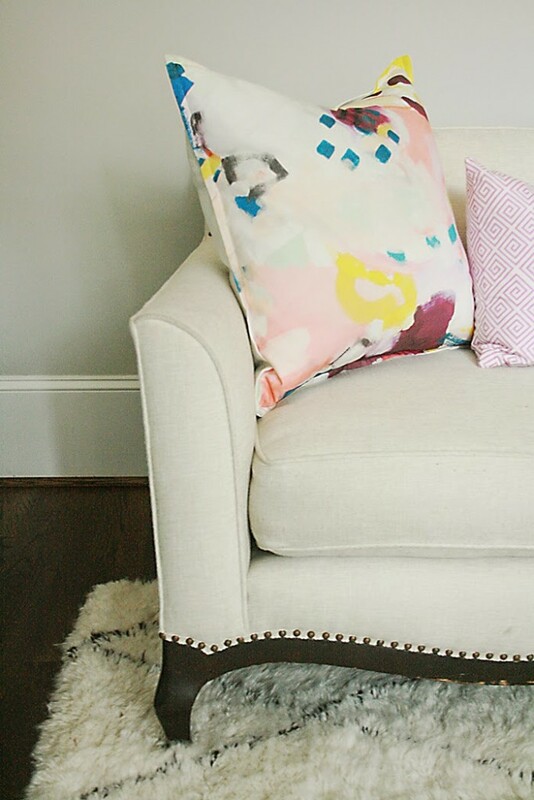 There was brass nails along the back side of the sofa and bottom. 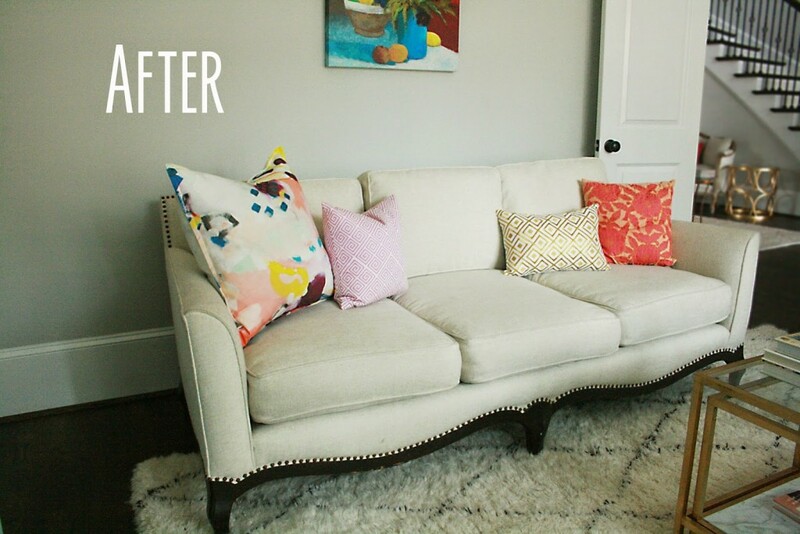 Here is the AFTER of the sofa. 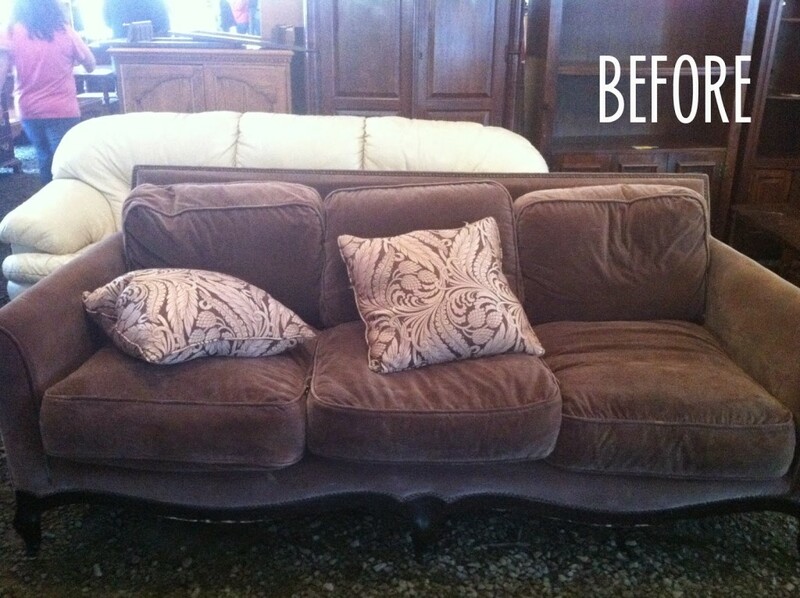 I had it professionally upholstered so the cushions could be re-stuffed and not so slouchy. 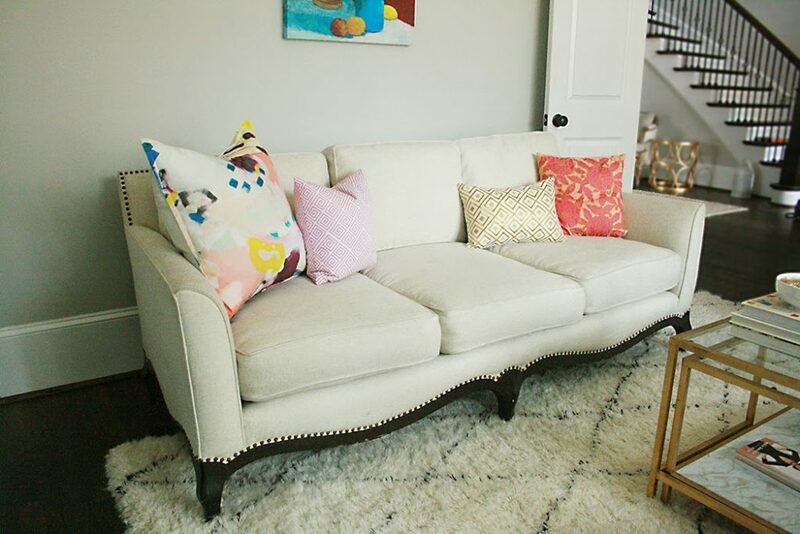 I reupholstered it in a Calico Corners high performance cream-colored fabric. 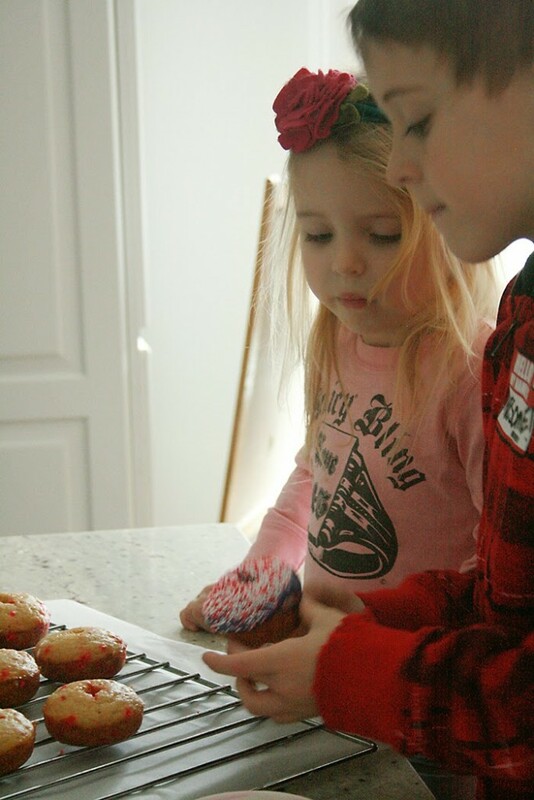 Since my babies were little, it’s been a tradition to have a Valentine’s breakfast on the 14th with everything pink and heart shaped–pancakes and bacon and strawberry milk and fresh fruit. My kids love it. 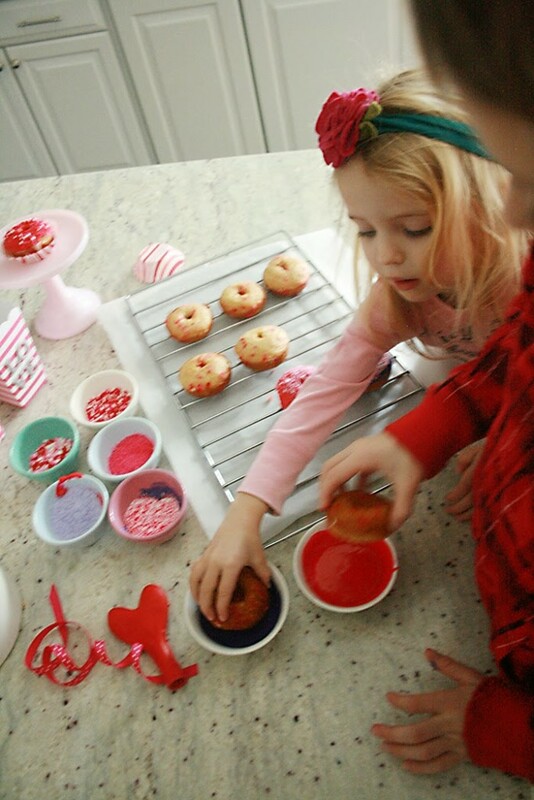 Since Valentines is on Saturday this year and not a school night, I will be able to put a little more time into our Valentine’s breakfast, so baked doughnuts is on the menu. 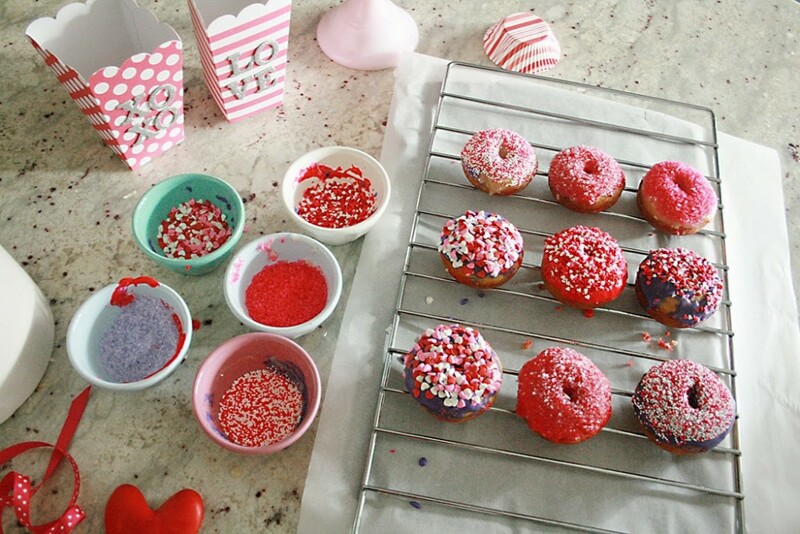 I followed Sally’s baked doughnuts recipe, and I let the kids decorate with pink and purple glaze and valentine-themed sprinkles. 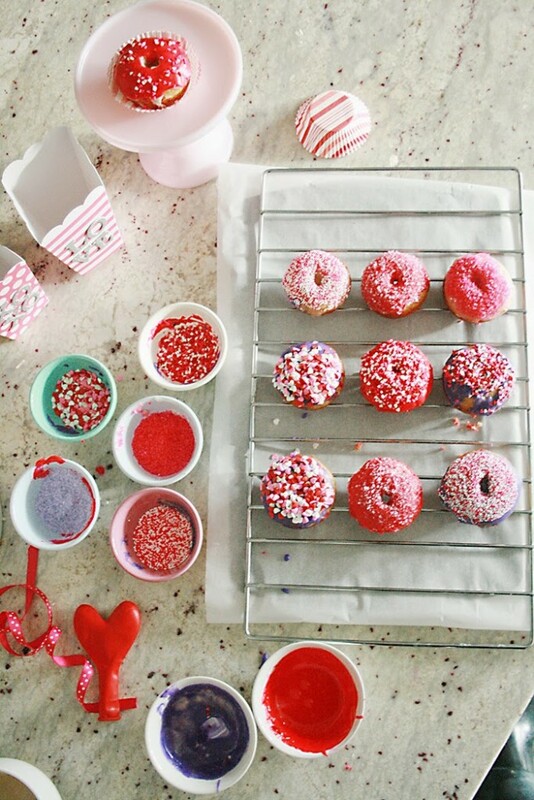 It’s best to put the sprinkles and glaze in small bowls and just dunk the doughnuts upside down to give it a full coverage and easy clean up. We made enough to give as gifts that my kids are giving to their teachers. 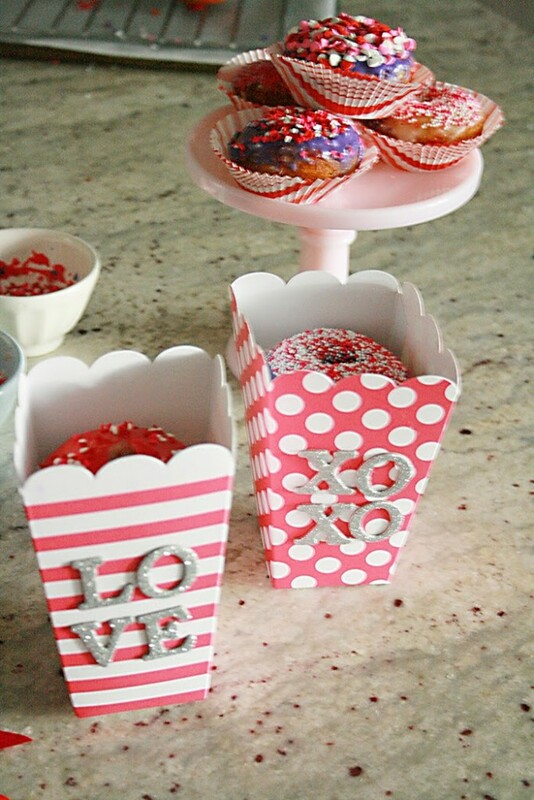 I just took a popcorn box, filled the bottom with cinnamon heart candy and topped with a couple of doughnuts. The heart balloon will be attached to the outside of the box with a note from my kids. 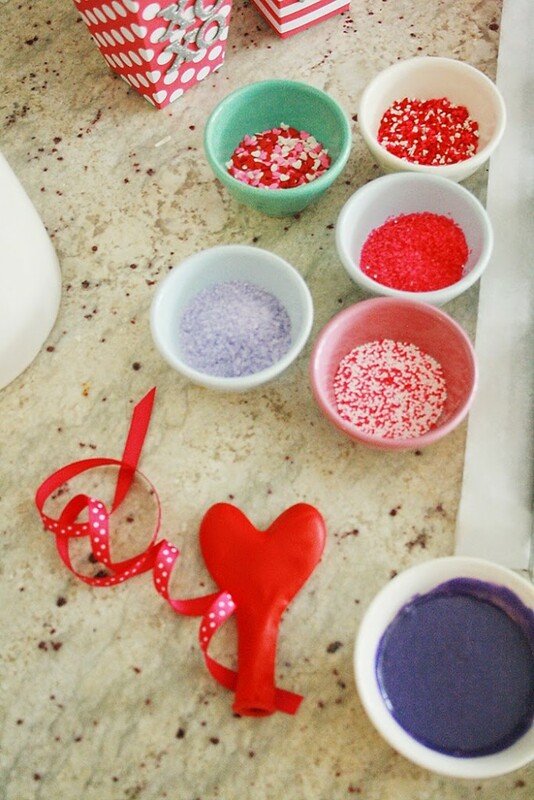 See more valentine’s day activities.